You are currently browsing the category archive for the ‘Memoir’ category. A few days earlier when she asked, Am I dying? I replied, Yes and everything is taken care of. with her those final days. to join the team caring for her at home. Deedee was the carer closest to my mom. connected to her sleeping porch. Listening for any changes, any sounds. my older son joined us. and looked at us both. I remember. The final day I had with you Mom. 1 March 2011. I was there when you opened your eyes, looked at me and your grandson Nathan and then closed your eyes forever. A few days earlier you had asked me if you were dying. I said yes and that everything was taken care of, you could go in peace. And you did. Yesterday I got out your blue jean jacket with the patches from one of your trips to Africa. You sewed all the patches and embroidered the outline of the African continent on the back of the jacket. I live surrounded by you. Whenever I go out, I open up the drawers with your jewelry and choose something to wear. Bracelets, necklaces, so many to choose from. You are always with me and will be forever. Let me write about Jim’s cousin, Li Anping, who lived in Beijing. How long have I known him? Forever more or less. How many ways has he helped me? Many, but one stands out. Over ten years ago I suffered from dizziness – making my everyday life difficult. When I got out of bed some days, nothing obeyed gravity, including my own body. The dizziness occurred off and on for years. Stress related but something more. I went to many doctors and clinics in several countries. With no success. While visiting Beijing in 2002, Anping took me to Dr. Gu’s clinic. A small somewhat dark place – full of large machines – and people hooked up to them. Some of them jerking from electrical charges. The scene was somewhat off putting, but I trusted Anping. Besides nothing else had worked. Dr. Gu sent me to a nearby hospital for what? Everything was written in Chinese characters so I had to go with Anping and assume all would be well. Anping does speak English but doesn’t know all the technical terms. I got a scan of my head. I brought back the picture of my neck and head to Dr. Gu. Anping translated. Dr. Gu pointed to certain regions of my neck and head. His diagnosis: blockage in my neck by calcium deposits, leading to not enough blood circulating in some areas of my brain, affecting my sense of balance. Dr. Gu started treatment right away, hooking me up to one of those large machines that give small electric impulses. He told Anping I would need several months of treatment. I was about to leave Beijing in two days, but decided I would come back some time and give it a try. Long story short, I returned the next year, 2003. I went five days a week for several months to Dr Gu’s clinic for electronic acupressure treatment while teaching nearby at Beijing Foreign Studies University. I even continued during the SARS epidemic when everything was shut down. When Dr. Gu had to shut his clinic due to the government policies enacted to stop SARS, one of his assistants brought a portable machine to a hotel near our apartment for my treatment to continue. The dizziness ended and has never returned. Thank you Dr. Gu. Thank you Anping! And thank you Anping for so many wonderful luncheons with Jim’s relatives in China. Thank you for your interest in keeping Jim and myself in touch with China and Jim’s relatives. Thank you for your suggestions for excursions and places to visit in China. Thank you for your big smiles whenever we got together. Li Anping died 20 November 2015 in Beijing, age 79. I am reposting the blog below about SIEV X that I posted in January 2014. Recently I returned to the SIEV X memorial and walked and read each post. This Sunday 11 October 2015 there will be a protest against the incarceration of asylum seekers on Manus and Nauru Islands, instead of bringing them to Australia for processing and resettling. The struggle for human rights goes on. JOIN US! In my last blog, I asked when does a death become a tragedy? Death is a normal event. When is it a tragedy? What does it depend upon? The relationship of the deceased person to you? The age of the deceased? The circumstances of their death? The examples I gave were from my own life – my friends and family members. Each death had a meaning – an impact on me and many others. Only one death, because it was preventable, that of my friend Tausi who died of stigma attached to HIV/AIDs, did I describe as a tragedy. Another criteria for tragedy is numerical. If there are many preventable deaths, is that a tragedy? What if we don’t know personally any of the people who died? Do we experience their deaths as a tragedy? On 20 October 2001, in international waters off of Australia, a small, very overcrowded fishing boat sank. This boat was not being used for fishing. This small boat was transporting 400 desperate people, mostly women and children, who were trying to get to Australia to seek asylum. The boat was labelled SIEV X – Suspected Illegal Entry Vessel X. 353 people drowned – 146 children, 142 women, 65 men. The drowning of 353 people jammed onto the small fishing boat called SIEV X is a tragedy. Although it happened over 12 years ago, SIEV X is a continuing tragedy for Australians. SIEV X is a tragedy that is burrowing away inside the heart and soul of this very large, mostly arid continent and country. The response that ignored the tragedy of the deaths of SIEV X is a tumor that is silently growing. Some people in Australia are trying to excise it, but many are feeding it, helping it to grow bigger and bigger. The mainstream media and political parties in Australia feed the growth of this ugly tumor. They categorize as “illegals”, the asylum seekers, most of whom are fleeing for their lives and have a genuine claim, according to international conventions signed by Australia. As a huge continent with a population of about 23 million, enjoying one of the highest standards of living on the planet, politicians and media have again and again whipped up fear of the “others”, who are supposedly planning to invade and take over Australia – much as the Europeans did to the original indigenuous Australians over 200 years ago. Opposed to this fear mongering, thousands of Australians are bringing people together to expose and destroy this tumor burrowing deep into the social fabric. 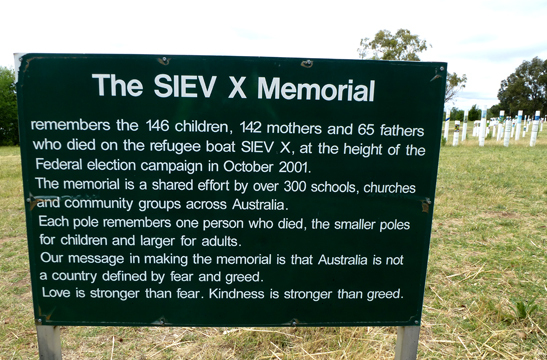 One of the most splendid and inspiring examples of this positive response is the SIEV X Memorial, which acknowledges a profound tragedy that affects us all. I first discovered the SIEV X Memorial by accident. After a picnic in Canberra, Australia, I walked around Weston Park. 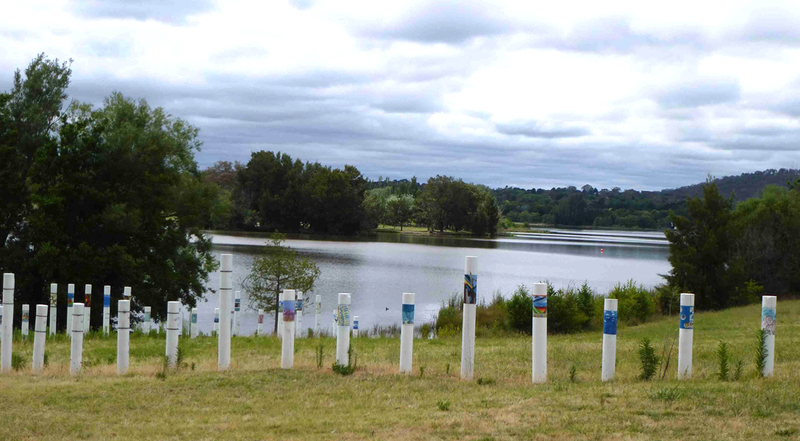 I saw a number of white poles, similar to Aboriginal memorial poles, on a hillside overlooking Lake Burley Griffin. 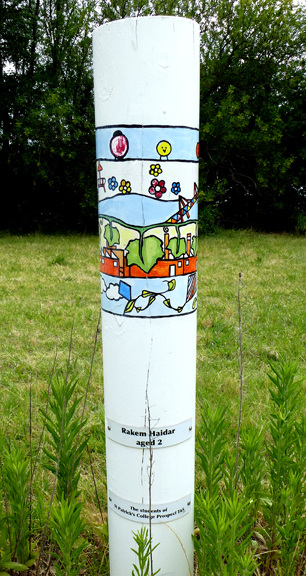 Each pole has a unique painting, a plaque with the name and age of the person who drowned or “unknown” on it and a second plaque with the name of the group in Australia who painted the memorial pole. 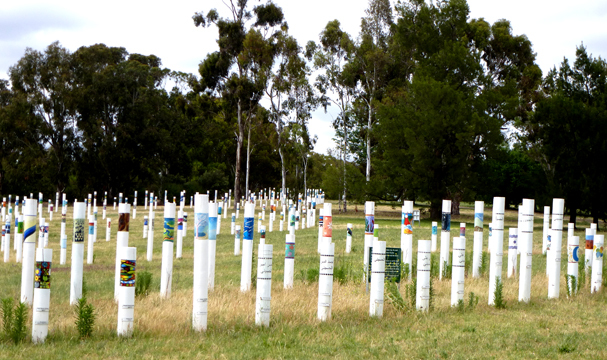 I looked carefully at each pole – 353 for the people who died when the SIEV X boat sank in October 2001. I walked the entire 400 metres reading each plaque, overwhelmed by the pain of this tragedy. At the same time I was encouraged that thousands of Australians throughout the country participated in creating the SIEV X Memorial.